At Moburg Reporting we know what is important to you and your firm. We are committed to serving you by delivering accurate and timely transcripts. Our team of professional, certified court reporters are knowledgeable, highly skilled, and capable of handling complex litigation. Moburg Reporting is locally owned and operated. We cover all of Washington and, upon request, our office staff will assist in locating court reporters nationwide. 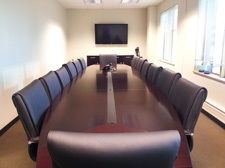 Complimentary conference rooms are available in our Seattle office and include complimentary coffee and wireless internet. Schedule with us today and see why Moburg Reporting has such an excellent reputation. Cole | Wathen | Leid | Hall P.C.